Didn't want to derail the Shapeways thread with my own stuff, so I'm starting up a thread here. My illustration work tends to keep me in fantasy stuff, so I don't get much of a chance to have dinosaurs creeping in as much as I'd like. So I've taken up digital sculpting lately to scratch that itch! 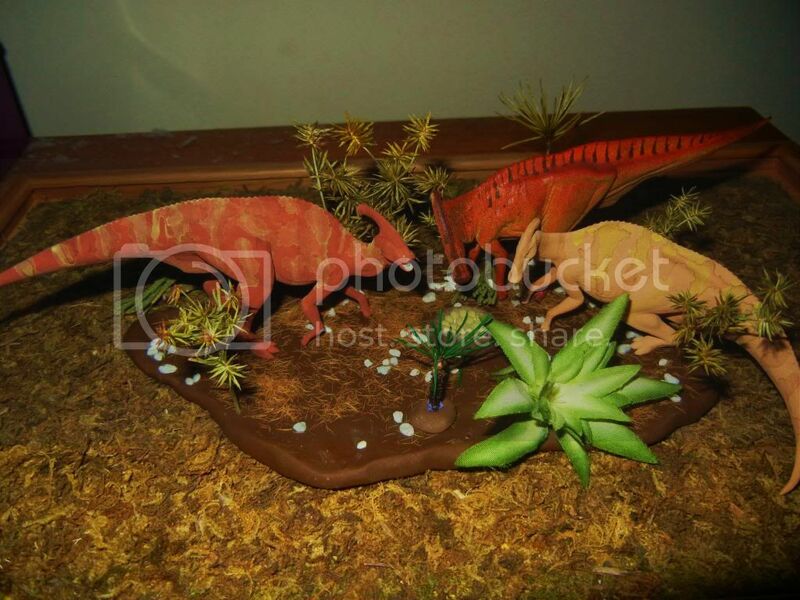 Here's some things I've been working on, Carnotaurus (and the subsequent prints I had made of it), and my next WIP - a Parasaurolophus. 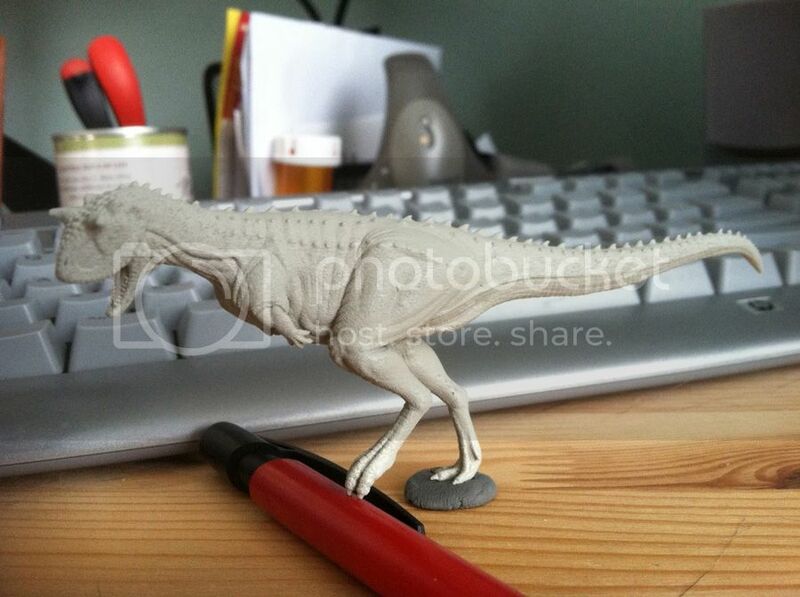 The Carnotaurus is available on Shapeways for any interested, and more will be added as time goes on. Enjoy! The Para looks good..what poses are you considering ? 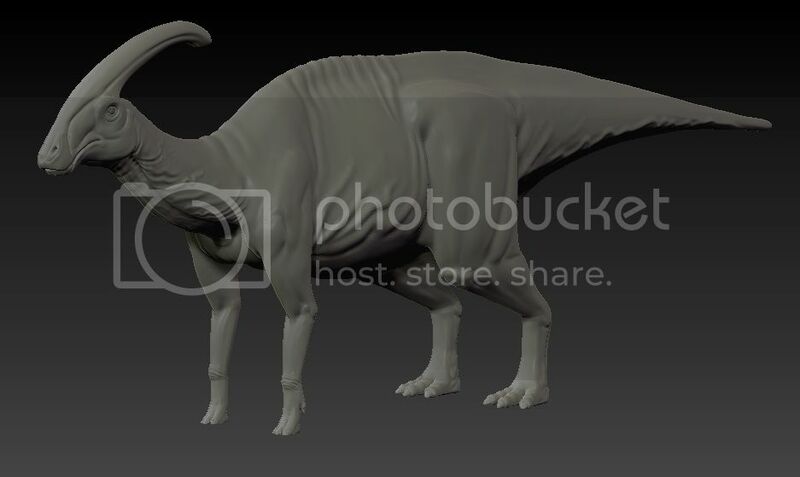 Yeah, that was something I'm still debating with him - Has there ever been a consensus on if hadrosaurs had cheeks, or if they just had that internal sort of flap you see on therapods? I've seen the latter a bit more lately, so now I've been doubting myself on what's the more agreed upon reconstruction. Considering this is the third time I've changed his mouth, I'm sure there will be a few more times before I'm through, lol. As for poses, I wanted to do a decent handful so a herd diorama could be made up without much fuss in terms of modification (since I'm rubbish at that sort of thing and waaaay too squeamish about potentially wrecking a model.) Off the top of my head, I know I'd like to do a laying pose, maybe, a hooting "I'm standing up and warding you off because I don't like the way you look" pose, scratching an itch, grazing, and a standard "moving about" pose. Best thing about doing these digitally is that it does make it ridiculously easy to fool about with poses to see what looks fun, so I can just keep adding more if I like 'em. I think once I finish him up I'll probably convert him over to a juvenile version as well, though I need to dig up some info on their growth changes so I can try and at least be semi-accurate. At the very least it'd be nice to have a few smaller fellows that can be mixed into the herd. Running Carno at 1/40 please. And cheeks on the Para. As for poses, I wanted to do a decent handful so a herd diorama could be made up without much fuss in terms of modification. Off the top of my head, I know I'd like to do a laying pose, maybe, a hooting "I'm standing up and warding you off because I don't like the way you look" pose, scratching an itch, grazing, and a standard "moving about" pose. Best thing about doing these digitally is that it does make it ridiculously easy to fool about with poses to see what looks fun, so I can just keep adding more if I like 'em. All of them 1/40 please Nice Job! Patrx, yeah...that was something I kinda figured out about 3/4 of the way through the sculpt. I ended up deciding to go with it instead of fixing it because I thought it'd give it a bit of a nice visual punch at that scale. I'll be sure to tone that down for future sculpts for sure though. Speaking of, update on the Para - finally got around to opening his mouth up, which if I was smart about it I would have taken care of it back when I was box modeling the devil, but at the time I wasn't certain what my needs were going to be. Learning one dinosaur at a time! EDIT: Forgot to mention, also decided to give him cheeks, mostly. It ended up looking too weird seeing him with that long of a mouth. These are wonderful, Gorgonzola. I look forward to seeing more (and hopefully purchasing some one fine day). I also prefer my ornithischians with cheeks. 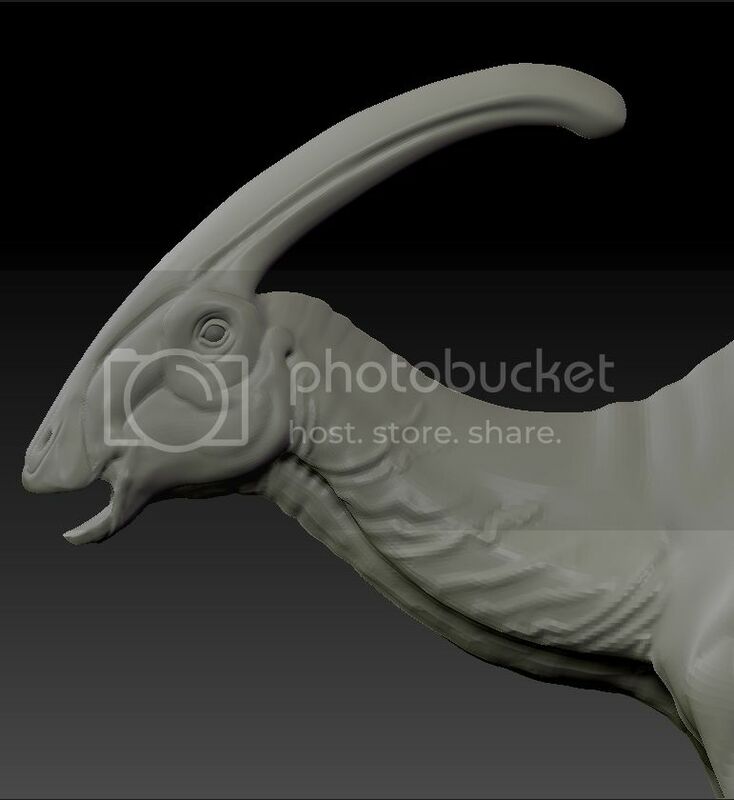 The Para looks much better with cheeks That's why I never liked the original Kinto Parasaurolophus model, the bizarre mouth was just too distracting to me. However, at this point it is not necessarily "wrong" to show these openings (http://1.bp.blogspot.com/-iV0nYwg2kbU/URyuhmlaZcI/AAAAAAAAOKs/tftWn8NPMFs/s1600/2+hartensteinabroad+Taichung+Alligator+Crocodile+Farm+Taiwan+%E5%8F%B0%E4%B8%AD%E9%B3%84%E9%B1%BC%E5%85%BB%E6%AE%96%E5%9C%BA.JPG, the temporal openings are quite clear on some of these crocodiles. Here is another example http://en.wikipedia.org/wiki/File:Indian_Gharial_Crocodile_Digon3.JPG or bulging out http://www.arkive.org/gharial/gavialis-gangeticus/image-G114512.html.). 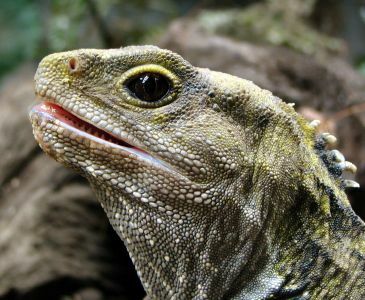 In this example you can clearly see that the "postorbital" opening is visible (http://www.flickr.com/photos/sidm/5253662054/sizes/o/in/photostream/ and http://www.sciencealert.com.au/images/stories/university_of_new_south_wales/tuatara.jpg). 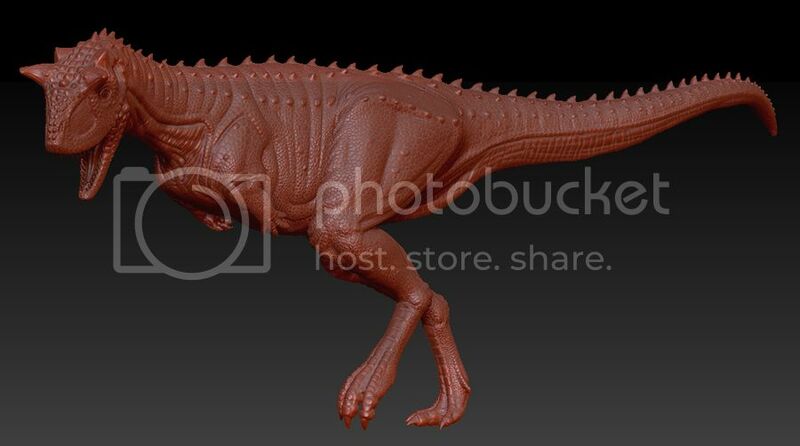 I think the biggest problem is the orientation of the hands on the Carnotaurus. Their hands should probably be facing almost to the front rather than facing medially as in most theropods. 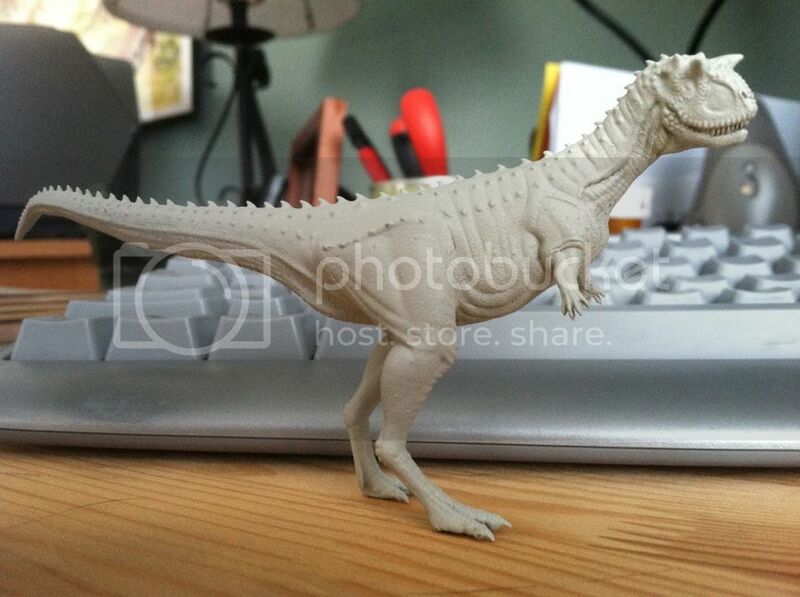 Speaking of the Carno, I just a notice saying that Shapeways had to cancel an order on the running pose because of "thin walls". Checking the jpeg they sent me, it turns out it was the same issue I had with the standing pose when I tried to order it in FUD. Already fixed it and uploaded the updated model, it's just annoying to be notified of that after someone orders it. Back to work on the Para! The Para does look better I think now. That's interesting on Carno's hands..I'll have to keep that in mind when I start mine. Thank you Wings! Yeah, I got my terms mixed up. I'll be putting that paper on my reading list today. EDIT: I just looked at the diagram and started to give the paper a skim. It's even more messed up than I thought. 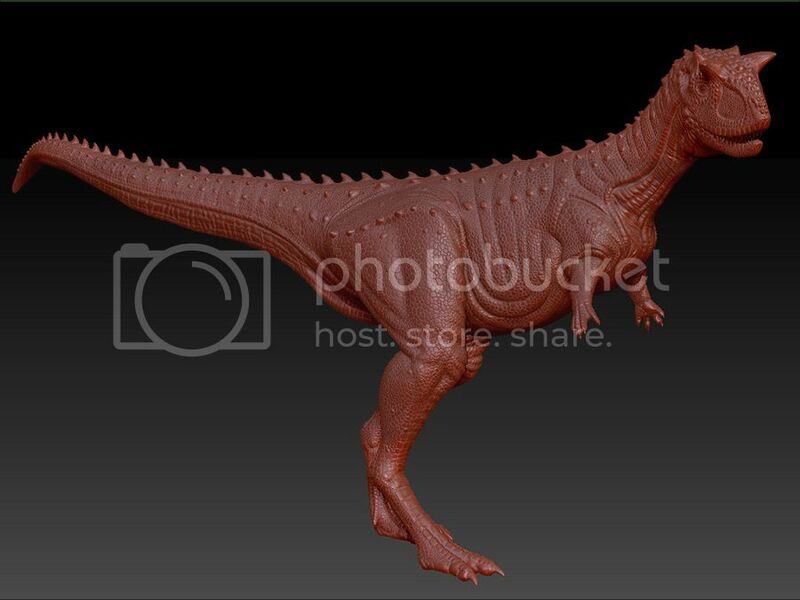 Speaking of the Carnotaurus, I took a few minutes this morning to convert the running pose over to 1/40 scale, and it seems to have passed Shapeways automated checks and is sitting on my store. Normally I'd like to order myself a print first to make sure everything checked out okay, but if anyone is adventurous I can put it up for sale let it out in the wild. Just not sure whether I should order in WSF or FD. I like WSF because I like the solid feeling of the models, but FD is nice in its own way too. Tyrantqueen, you'll be the guinea pig then. I'll send you a PM with the private sale link. If everything goes well I'll make it available in a week or two, when the model should be delivered.